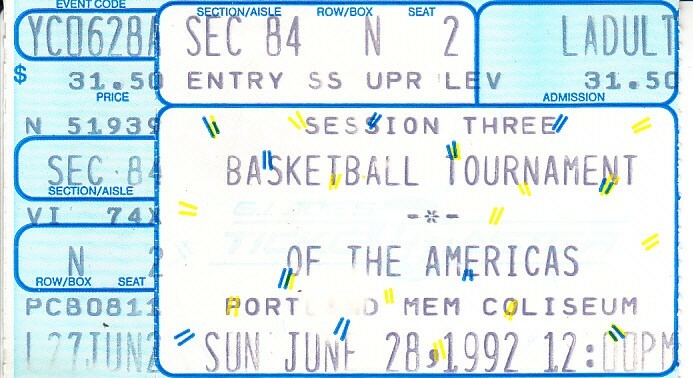 Extremely rare ticket stub from the June 28 afternoon session of the 1992 Basketball Tournament of the Americas which featured the FIRST EVER competitive game played by the 1992 USA Dream Team including Michael Jordan, Larry Bird, Magic Johnson etc. The USA routed Cuba 136-57. 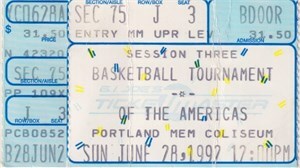 Ticket has minor to moderate flaws. ONLY ONE IN THIS CONDITION AVAILABLE FOR SALE.